I've been having some fun this past week... in all my spare time (what a hoot that is! )...hanging out in my sewing room surrounded by old jeans and bits of fabric!! 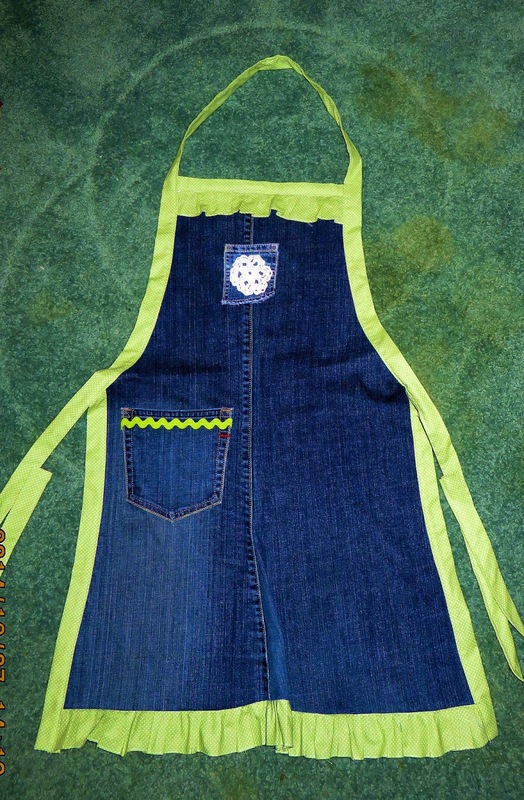 I wanted to do something different for a couple friends for Christmas this year and came up with the idea of making some jean aprons. I only had one pair that I had been saving... the other ones were too far gone to make anything out of... so I paid a trip to the thrift store and bought a couple pair to play with. They are pretty easy to make... just take some left over material from other projects, old jeans that aren't totally clapped out (grin), some patience, a good iron, a sewing machine,bits of this and that (i.e. buttons, ribbon, old doilies, you get the picture) some more patience and time... I am rather pleased with how they have turned out so far. I even made one for the grandson of one of my pool buddies (unfortunately I didn't take a photo of it... just plain forgot!. 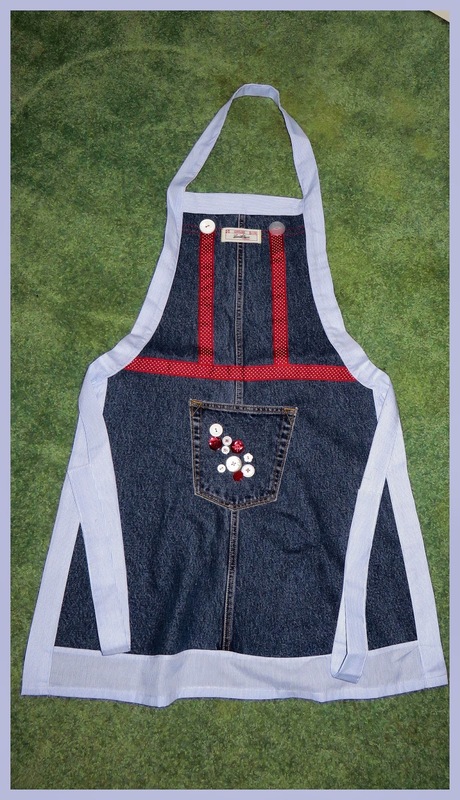 This apron has a light blue striped material around the edges and some red polka dot ribbon for "braces". I raided my button jars and sewed a bunch of red and white buttons on the pocket! Salvage the labels off the jeans... you can use them for decoration too! 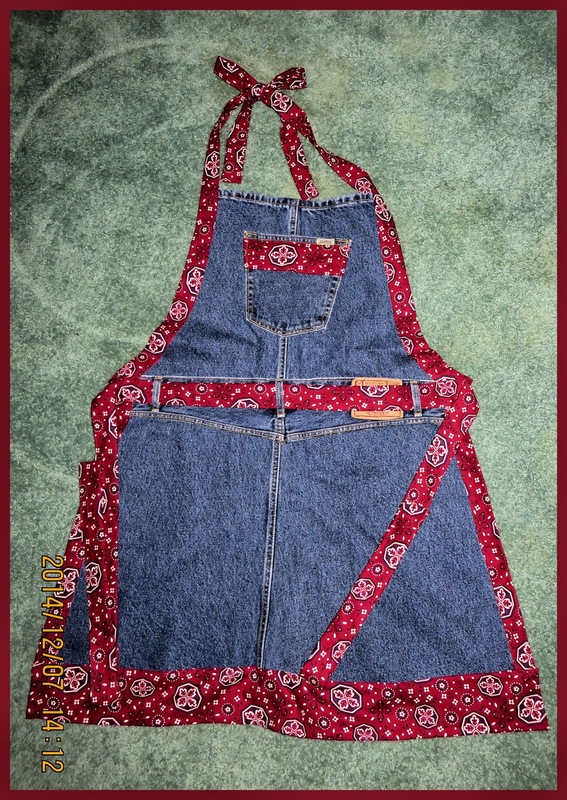 This one was a fun one to make with some bandana fabric I bought last summer for another project (which is now not going to happen because it's been confiscated for these aprons... oh well...) If you want to tackle one like this just make sure you have a good sharp jeans needle in your machine! 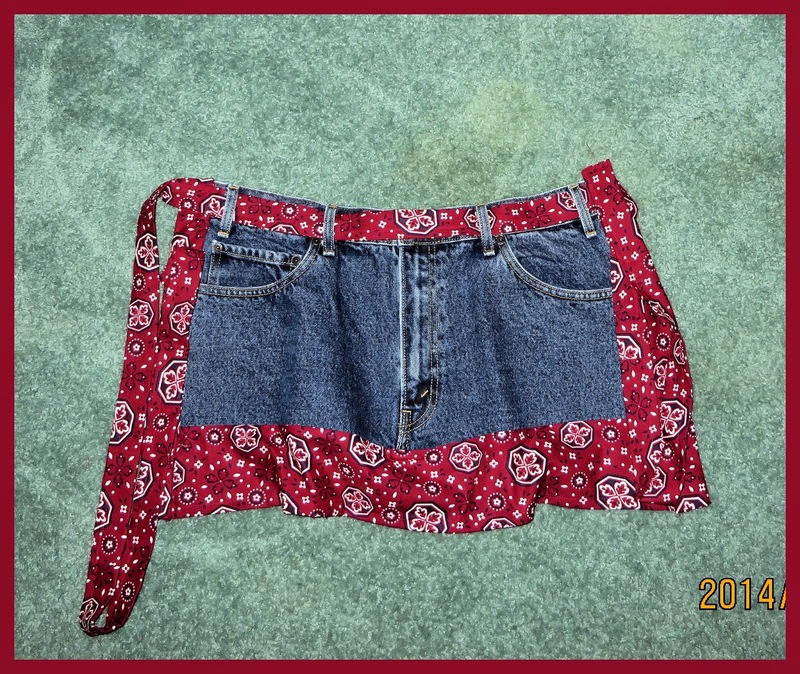 This next one is a "shortie"... great for wearing around a barbeque... maybe hubby will get this one under the tree! And just to show you something you can make with jean "scraps"... here's a table runner... and yes it is straight... it's just the angle that the photo was taken at that makes it look out of "whack"! If you are interested in finding out how to make these... just leave me a comment. If there is enough interest, I'll write up a small tutorial. Thank you so much for taking the time to leave a wise, witty or wonderful comment. I truly appreciate it. Unfortunately, a marked increase in spam has made it necessary to turn on word verification again. Hope you understand! Inspired by a lifelong love affair with art and storytelling, I am a self taught artist who combines both loves through sculpting and creating polymer clay characters that tell a story. 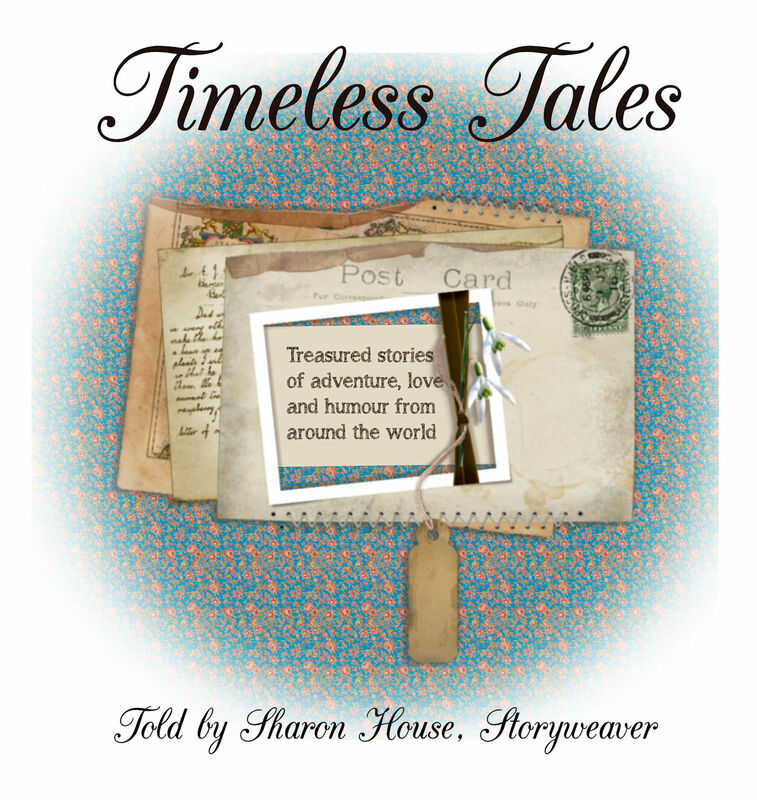 Stories & tales to touch your heart, make you smile and even provide a chuckle or two along the way whether you are 8, 98 or somewhere in between! Copyright 2008-2019 Dr. Sharon House. All rights reserved.. Simple theme. Powered by Blogger.